Do you find yourself wishing you had more privacy? Do you find yourself wishing you had more privacy? Nobody can be truly alone, as much as they’d like to be hidden away from the presence of other people. So if you are looking for a privacy fence this winter, here are some advantages to consider. First of all, a privacy fence will increase your home’s security. Did you know you can also cut some of your homeowners insurance rates with a privacy fence? 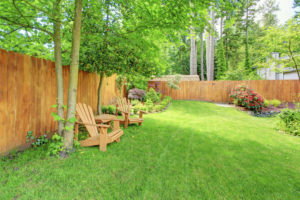 If you feel like your could be more secure, consider adding a privacy fence to your yard. It’ll discourage burglars and other intruders from sneaking in while you are asleep or away from home for a few days – and help keep your pets inside your yard, too. Yes, a privacy fence can help keep your pets safe. Do you have both cats and dogs? Whether you’ve got a curious pup who likes to bark at everything that moves, or a clever cat who loves to roam around outside when it thinks you’re not looking, use a privacy fence to keep them on your property. Likewise, a privacy fence will keep out strange animals from interacting with your fur babies or hurting your friends and family. Think about the winter weather in your area. If you’d like to make sure there isn’t as much snow, ice, and window causing chaos around your landscape, then a privacy fence is the solution you need. Do you have a tense relationship with your neighbor? What could have caused your argument? In any case, a new privacy fence can mark your property line for all to see. Just remember that when you use your fence for this purpose, you’re going to need to talk to your neighbor. This entry was posted on Friday, December 22nd, 2017 at 2:21 pm. Both comments and pings are currently closed.